"Why do we all have to be here?" I wondered last weekend as I sat in a small meeting space on the fourth floor of the Children's Hospital in our city. I looked around at the 75 or so other faces, all with somber expressions. We were there for a remembrance service. We all had a child who died in the past two years. The "why" question is one I have been asking myself since April 22, 2009, the day my five-year-old son was diagnosed with cancer. Why did it have to be him? Why does it have to be terminal? Why didn't we know sooner?Why now? I could drive myself to the mental institution trying to figure out the answers to those "whys", so I only allow myself to ask those questions on really dark days, down moments. But I don't linger too long on them because they are questions with no answers. I mean, really, why does any bad thing happen? Why do children die? Why are some of them violently molested, by members of their own families no less? Why are small children made to suffer? Children who are supposedly born innocent with no sin (here comes the Catholic in me)? Why does anyone get cancer, Parkinson's, ALS, or any other degenerating disease? Why are babies born with birth defects? Was it something their parents did? In my darkly depressed, irrational moments I tell myself that the reason that one of my twins is dead and the other one was born with a birth defect and lifelong "issues" is because we underwent fertility treatments to conceive them. But that's crazy, right? A lot of people have conceived children with the help of fertility treatments, namely IVF. And their babies were perfectly fine. So that can't be a reason, can it? Some people would say that it is. There is a huge group of people who sincerely believe that 'everything happens for a reason.' So much so that this phrase is thrown into every conversation, for every situation. Your child didn't get into your first choice preschool? Oh, it happened for a reason because you found an even better one. (Wouldn't all preschools, you as a good parent are looking into, be a good fit for your child?) You didn't get the first job you interviewed for? But you got an even better one (though you applied for, like, 20, so weren't you bound to get something?). Everyday situations, okay, fine, maybe there is some force at work in the world that keeps us going on to "something better." But I challenge anyone, dare them, to say this phrase to someone who has just lost a loved one and see if they don't at least get a kick in the shins, or worse. I remember when my friend's dad died suddenly of a brain aneurysm when she was 19. People actually said this to her. And I remember our conversation after the funeral. We couldn't find a single reason why he wouldn't be there to guide her life, see her graduate from college, walk her down the aisle, or play with her children. Nope, not a single one. They did donate his organs to several other people, so is that the reason he had to die at such a young age? I remember 9/11 clearly, as does everyone else. I laid on my couch crying for a week wondering why thousands of innocent Americans had to die, thinking I or anyone I loved could have been one of them. Why spouses were left without their life partners, children were left without parents, why some would never see their wedding day or their child be born. If the idea was that Americans are evil and had to suffer, why not kill the murderers, pedophiles, drug dealers, even soldiers who commit crimes against humanity in the name of war? 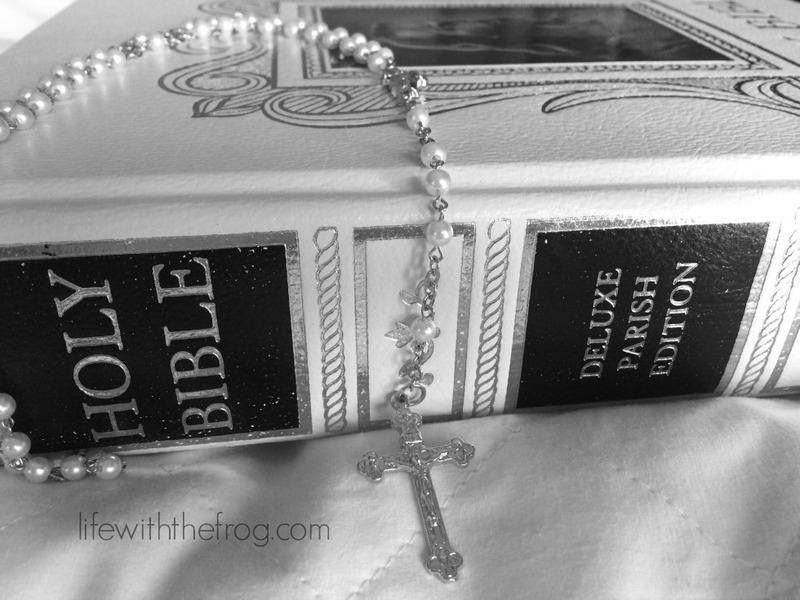 I have been a Catholic my whole life, and therefore taught to believe that everything in the Bible is the truth, that all the stories of death, destruction, disease, and plague happened because people needed to be punished. Although, there is a huge part of me who wonders if these are simply stories intended to teach morality. If God is our Father and creator, then He loves us and doesn't want to see us hurt. He forgives all, right? As parents, yes, sometimes we let our children fail, or feel sadness, shame, or regret just so they will learn a lesson. But to intentionally cause something horrible to happen to our own children just so they can become better from it? Well, doesn't work if they are dead now does it? No, I choose to believe that the God I love doesn't hurt us on purpose. Maybe He does have a "plan" for us all, but I don't believe it is to make us suffer. I like to think of Him as a wind-up toy maker. He has created us and sets us on a path. When we run into an obstacle, we can turn to Him, and He will set us right again. Sometimes, He may have to carry us to the next destination, but that's okay. And yes, if we open our hearts and minds, we can learn from the bad things that happen and make better choices. Like the people who donate their loved one's organs after his death. Like the people who start a foundation or scholarship fund in their child's name. Like the people who work to raise money to find cures for deadly diseases. Like the people who lobby our lawmakers for better laws, health care, and national security. But what of the people who simply become bitter, mean, and angry, delving themselves into the depths of alcoholism, drug abuse, depression, suicide, and revenge? Then what of the 'reason' for the awful event in their lives?? What of the people who just go on with their lives and never make any significant changes? What good has that done? As for me, when I do try to make sense of my son's death, when I do try to come up with the "reason," sometimes I think I wouldn't be writing if Joey hadn't died. Keeping a journal on Caring Bridge and having people comment on how it made them feel, inspired me to start this blog, which inspired me to submit freelance pieces, which is something I have always wanted to do. But did he really have to die for me to do that? I can't be sure. What I can be sure of is that it makes me understand other people's pain a little more. It makes me understand that no matter how big or how small, everyone carries a burden with them that is significant to them, and that we can't discount another person's suffering just because it is unlike our own. It has made me kinder to other people, more willing to listen, more available to help in even the littlest way, and hope that inspires others to do the same. So, is that the answer? 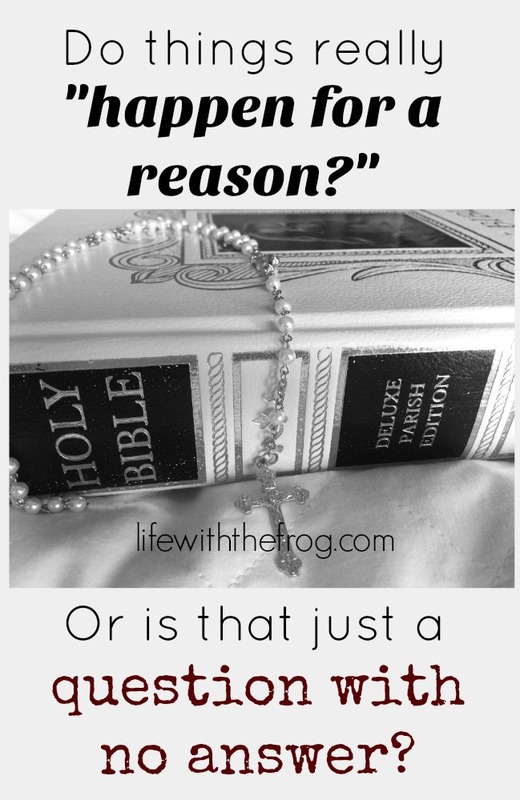 Do things really happen for a reason? I think I'm still going to have to say that is a question with no definitive answer.